When we talk about the value of learning, it’s commonly linked to increasing the capabilities of the larger organization to drive performance, productivity and business outcomes. But as the workforce becomes more saturated and diverse, employees are finding out that their ability to get new and improved jobs aka employability, is based on their skills. And to keep up, worker capabilities need to be improving all the time. Rightfully so, workers are demanding opportunities to learn and gain new skills. The smartest CLO’s realize that if they don’t enable continuous growth in-house, and offer a variety of learning experiences and opportunities, employees will leave. 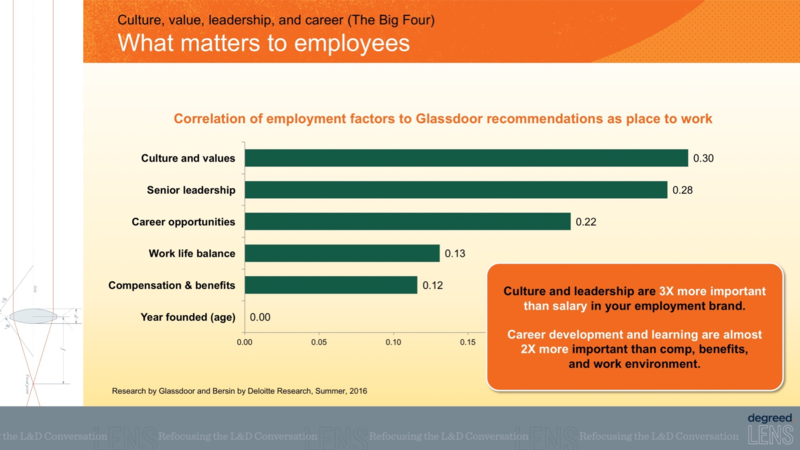 At the Degreed LENS event in November, learning analyst Josh Bersin shared that career development and learning are almost 2x more important than compensation and benefits to employees. “When high performers leave your company, it’s usually because they felt they could find a better opportunity, more growth, more development by going to work for another company. It wasn’t for more money; it’s rarely for more money,” said Bersin. 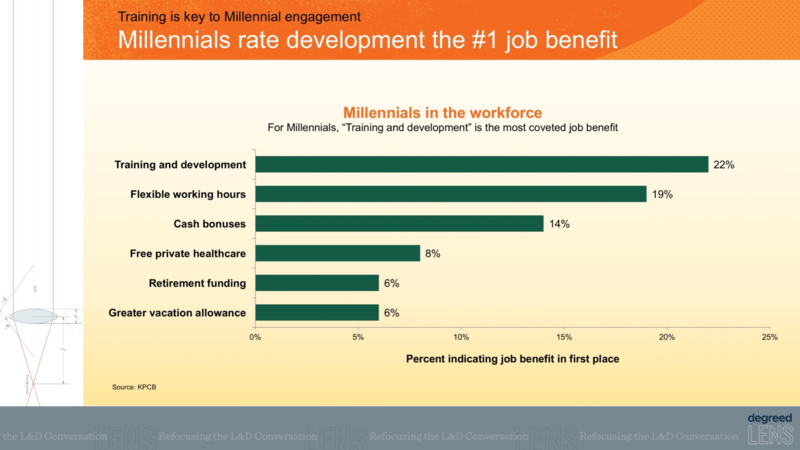 And for those specifically interested in reaching millennials, lack of growth opportunities is the number one reason they will leave your company. Though a key factor to employee satisfaction, only 18% of the people Degreed surveyed said they would recommend their employer’s learning and development opportunities to a colleague. This is a big missed opportunity and an important issue. Building a meaningful learning experience has become more than job productivity – it’s your brand, your ability to attract people, your ability to retain them. At the LENS event, Bersin revealed there are 20 different things that contribute to an employee’s sense of mission, purpose and engagement with your company– almost half of them relate to learning. 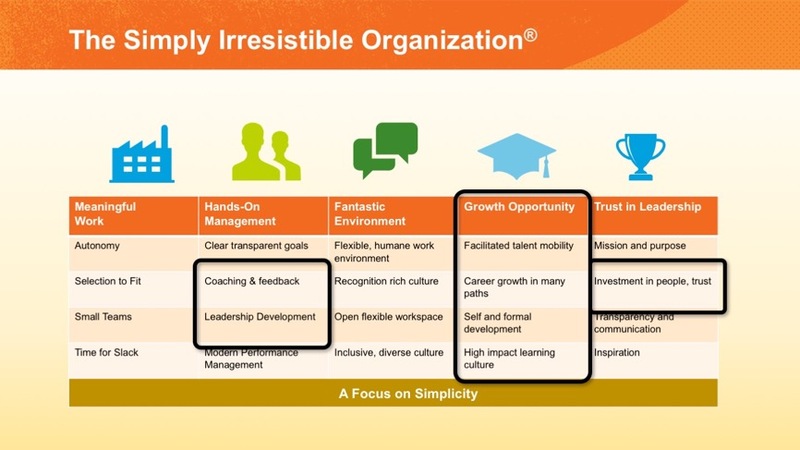 “Learning owns probably 30 or 40 percent of the employment brand in your company. The issue of how we learn and how we share information in companies is very essential to the employee experience at organizations,” shared Bersin. People are a big expense – up to 70% of operating costs in many organizations. Investing in them through learning, keeping the workforce engaged is more vital than ever, and treating L&D as a core part of your brand’s success is essential to making that happen. Take the first steps to making learning part of your brand at Degreed.com.